We believe that the Holy Bible was written by men supernaturally inspired; that it is truth without any mixture of error for its matter; and therefore is, and shall remain to the end of the age, the only complete and final revelation of the will of God to man; the true center of the Christian union; and the supreme standard by which all human conduct, creeds, and opinions should be tried. 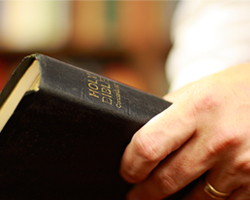 By “Holy Bible” we mean that collection of sixty-six books from Genesis through Revelation, which does not only contain the Word of God, but IS the very Word of God. By inspiration we mean that the books of the Bible were written by holy men of old, as they were moved by the Holy Spirit, in such a definite way that their writings were supernaturally and verbally inspired and free from error, as no other writings have ever been or ever will be inspired.